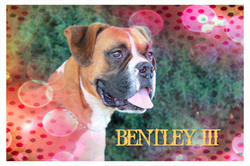 Bentley has all of the attributes of what we like to call a starter Boxer. He's great with people and other dogs and walks well on leash. He also happens to love kids. If you're considering making the transition from a "normal" dog to a Boxer, Bentley is the perfect guy to ease you through this transition. If not for his classic flashy fawn Boxer mug, you'd swear that someone pulled a switcheroo and you somehow wound up with a Labrador Retriever mix. Needless to say Bentley is a popular boy and we don't expect to have him with us at Hotel Sachi for very long. Act now so you don't miss out on Mr Bentley!